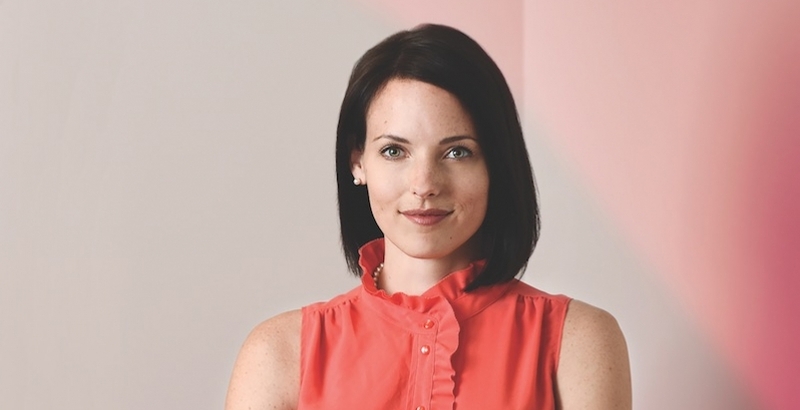 As a workplace strategist and senior interior designer at GS&P, I’m no stranger to the open-office controversy that’s taken hold recently. For many, open offices are considered to be a hallmark of progressive companies, replacing the infamous, isolating “cubicle farms” with open desking-based systems. Twitter, Virgin and Facebook are among the most high-profile companies to embrace the concept, but businesses of every size are relatively quick to jump on board. The benefits of open offices are well-documented. For employees: easy collaboration and impromptu meetings with colleagues supporting the flow of information, better access to daylight, and improved camaraderie. For businesses: there’s an obvious financial advantage, allowing companies to house more employees in less space as corporate real estate prices soar. But recently, those favorable opinions have started going a little sour. I see more and more “anti-open office” articles in my news feed, and I’ve talked one on one with companies expressing very legitimate concerns. 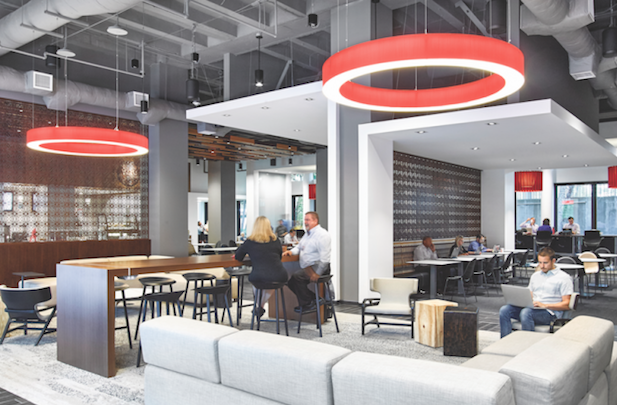 According to the International Facilities Management Association, more than 70 percent of American employees now work in an open office, a huge jump from just a decade ago, so issues were bound to arise as the trend became more pervasive. But the reality is that most people don’t like traditional cubicles, and it’s not feasible (nor advantageous) for every company to provide private, closed office space for every employee. Designing and managing with respect. Even the most focused, “in the zone” employees would struggle to be productive in the environment Lindsay describes. I’d recommend at least some physical barriers between employees, particularly when long tables are used in place of desk clusters or pods. A slight sense of separation between individuals is important, even if the separation is more psychological than physical. And I can imagine only a handful of companies where playing loud music on an overhead day-in and day-out would be appropriate. In an open office, company leadership should be extra-mindful of the potential for disruption and take every step to introduce calm and eliminate chaos. It’s our job as designers to educate clients about how to maximize their open workplace and provide guidance with office protocols for using the space. Bring on the heads-down space, and increase the ratio of meeting-space seats. Just like there are a wide range of personality types, there should be a wide range of workspaces to match. Some people feel stimulated and invigorated by open workspaces, but some people feel overwhelmed by the pressure to socialize. Workers in open offices need an escape: a place where they can focus, a place to make a personal call, a place to rejuvenate. So it’s imperative to include plenty of closed, quiet “heads-down” space in addition to just desks. What’s more: management should proactively encourage their use. Too many heads-down spaces are underused because employees are afraid to actually leave their desk. Companies frequently think modern offices are all about the open space, but in reality, it’s all about balance. The goal is flexibility, collaboration, productivity, engagement and innovation. Giving and encouraging “choice” will go a long way in achieving these goals. “The lack of space in cubicles and open office plan layouts is the primary reason for workers' frustration. Out of all the factors evaluated, amount of space was deemed most important. 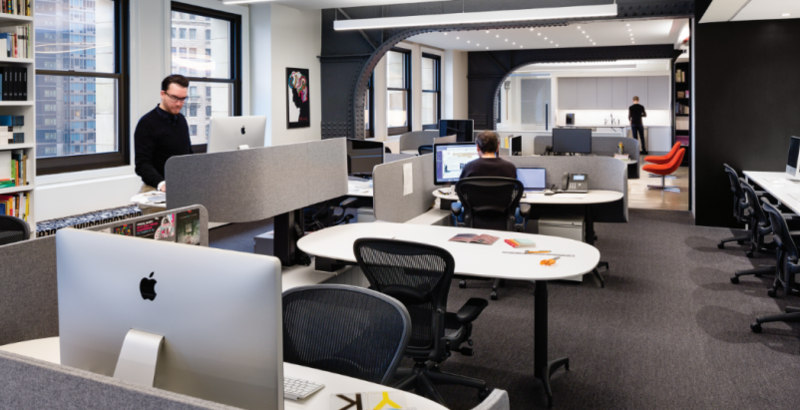 While it might seem counterintuitive for open office workers to complain about lack of space—they have the whole office!—people really just want some breathing room…” — From a workplace-focused article by Ariel Schwartz on FastCompany. I’m not sure I agree that lack of space is the primary complaint about open offices, but it’s certainly a big factor. There is a point at which densification leads to claustrophobia, so it takes an experienced designer to support the former without straying into the latter. And when employees feel trapped at their desks, it can be mentally constraining. No one wants to feel like they’re chained to their desk. As mentioned above, open offices should offer a multitude of seating alternatives and keep circulation areas spacious. And it’s important to find a way to at least give employees a comfortable amount of personal space; the key is doing it without wasting too much real estate. Plus, as companies become more progressive, they’re acknowledging the benefits of extending the workplace into the rest of the world (which is quite spacious). If an employee is feeling claustrophobic, they can make the park or the coffee shop their office for the day. Mobility is the perfect complement to an open office. Down the road, I believe that flexibility will become the ultimate key to success for businesses. I’m an advocate of open offices, but I’m well-aware of the potential for cons to outweigh pros if they’re designed poorly. Put simply, many of America’s open offices aren’t created with the employee in mind, and that’s where the problems begin. Fine-tuning an office to fit an organization’s processes, culture and behaviors is no easy task. Not only must you consider the introduction of shared space and adequate individual separation, but you must also consider how orientation of these elements could either encourage or discourage success. It’s essential to face these challenges head-on and not brush them off as inevitable side effects of the modern workplace. As designers, we have the knowledge and tools at our fingertips to deliver the solutions our clients need. About the Author: Jack E. Weber is a Principal in the Corporate and Urban Design division at Gresham, Smith & Partners, specializing in workplace strategies, planning and design.